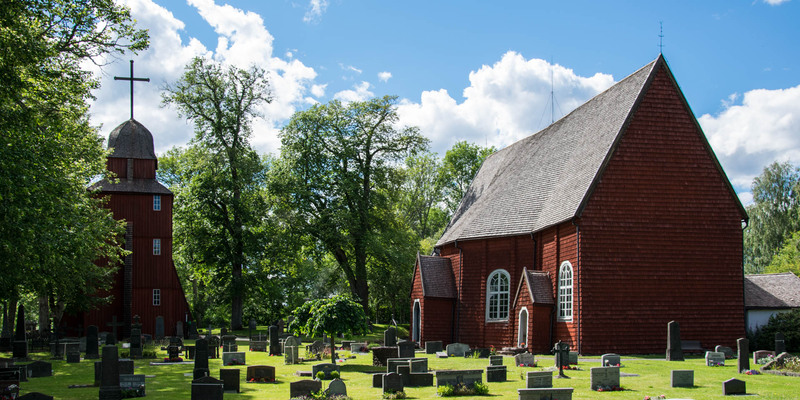 Näshults Kyrka, one of the few preserved wooden churches in Småland with a ship-shaped floor plan, is located in the parish Näshult, about 30 kilometers southeast of Vetlanda. Näshults Kyrka was consecrated in 1732 as the successor of a dilapidated wooden church from the 13th century, of which only the brick sacristy has survived until today. 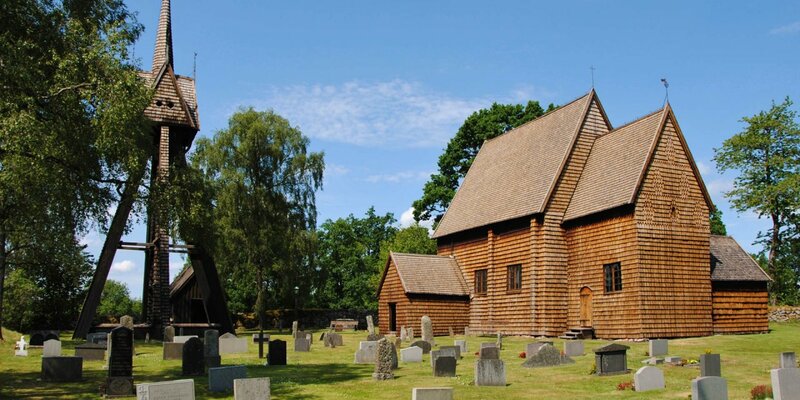 The built wooden church consists of a nave with large bulges in the middle of the long side walls that give the church the appearance of a ship's hull. 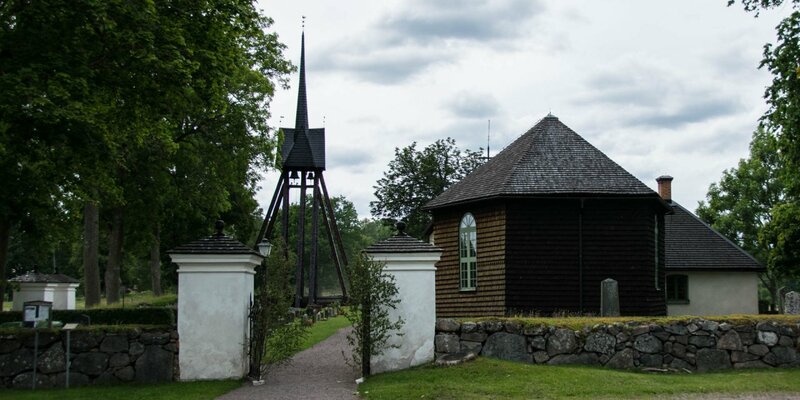 The outer walls of the church are covered with wooden shingles painted in the typical Swedish red color. The steep church roof is covered with tarred wooden shingles. The main entrances are each in a small vestibule on the bulges on the south and north sides of the church. The stand-alone belfry was built in the same year as the church itself. With its full-cladding also painted in red, it looks more like a tower and differs significantly from most other wooden belfries whose open wooden framework is usually covered at the top. The interior of the church largely corresponds to the then prevailing Baroque style. The straight wooden ceiling and the walls are painted in radiant colors with biblical motifs. The half-height border around the pews are also painted and the small doors to the individual rows of benches bear the names of the old courtyards belonging to the parish – identical on both sides of the aisle, since until the 1930s women and men sat on separate sides. A special eye-catcher is the late-Gothic altarpiece dating from the 15th century, most likely from one of the famous workshops in Lübeck. Also very elaborately designed is the pulpit with canopy. Dating back to the 17th century, it was originally Renaissance-style, but was altered in 1736 with magnificent Baroque carvings. The oldest artifacts are a 13th-century triumphal cross, which hangs near the baptismal font, and a shrine with a 14th-century Madonna on the north wall of the sanctuary. In its time, Näshults Kyrka was one of eight churches in Småland, which had a ship-shaped floor plan. 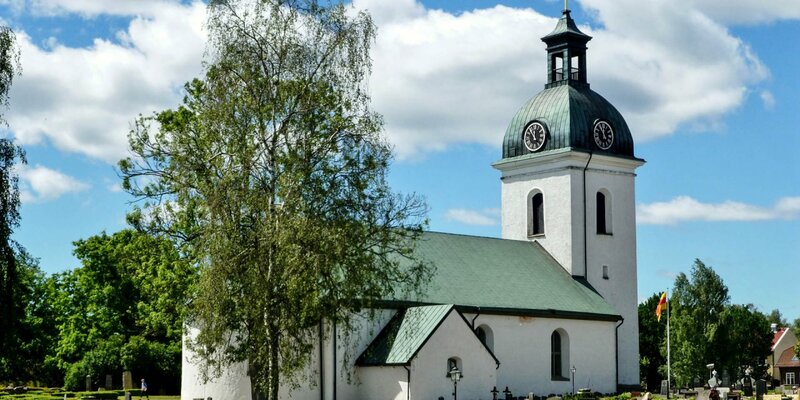 Apart from Näshullts Kyrka, only the Frödinge Kyrka in the municipality Vimmerby and the Kråksmåla Kyrka in the municipality Nybro have been preserved until today.